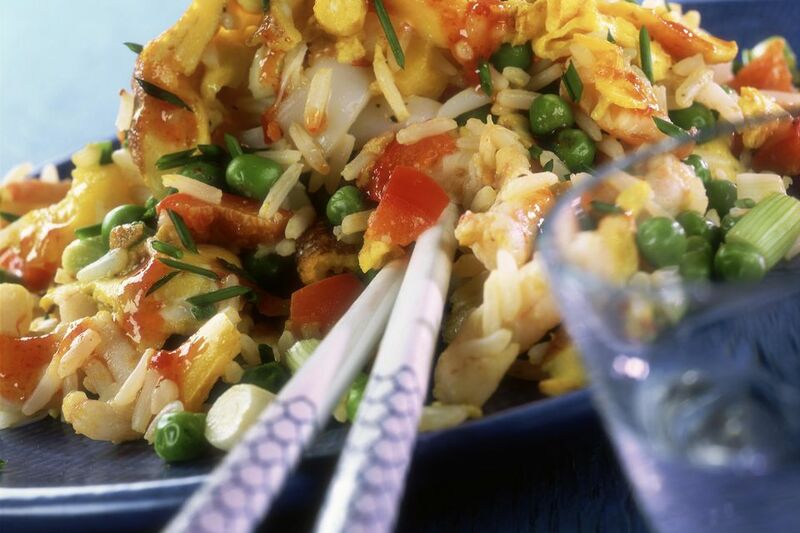 Tomato Egg Fried rice is a great way to use leftover cooked rice while helping your family get their daily serving of vegetables. The tomatoes lend a robust flavor to a quick and easy side dish, while the rice provides needed amino acids and complex carbohydrates. For best results use firm and ripe, but not overripe, tomatoes so that the fried rice is not too mushy. In a small bowl, beat the egg with sesame oil, salt, and pepper. Add 1 tablespoon oil to a preheated wok, tilting the wok and swirling the oil so that it covers the bottom. When the oil is hot, add the eggs. Cook, stirring until they are lightly scrambled but not too dry. Remove and clean out the pan. Heat 2 tablespoons oil in the wok, again tilting the wok so that the oil covers the bottom. When the oil is hot, add the chopped onion. Stir-fry for about 2 minutes, until the onion begins to soften. Add the rice, spreading it out in the pan. Let ​it cook briefly, then turn and stir until it is completely heated through (about 3 minutes). Add the tomato and stir-fry for a minute, gradually incorporating it into the rice. Add the eggs back into the pan and stir to mix in with the rice and tomatoes. Stir in the green onion and soy sauce. Taste and season with additional salt, pepper, and sesame oil if desired. Serve immediately.